There are a few tips that I recommend for anyone new to gold prospecting. This is the simplest way to get on to gold quickly is to make sure you are prospecting in an area that actually has gold. You don’t want to wander off aimlessly in search of gold that simply doesn’t exist. On the other hand, we have to realize that after 150 years of gold mining in the western United States, most of the easily accessible areas have been hit pretty hard. Areas that may have been rich with gold even a few decades ago are getting picked over pretty hard. This is why I always recommend that - assuming you are able-bodied and up to the challenge - you consider hitting the harder to access areas that others haven’t been to yet. Lots of mining areas have lots of road access and it they aren’t hard to get to. As a result, these areas have been hammered by other miners over they years. If you want to have good success I highly recommend that you work to get away from the crowds as much as you can. 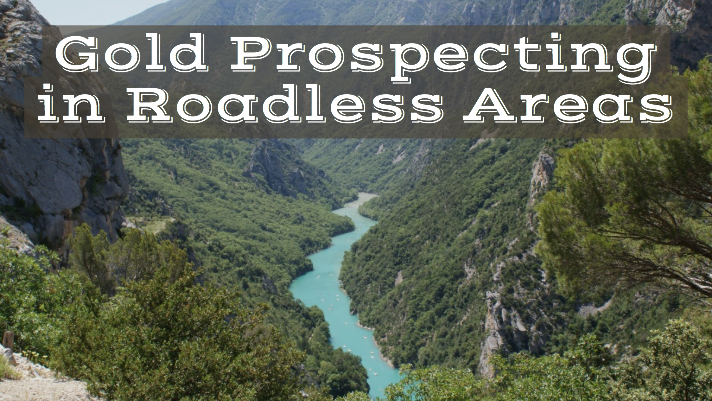 One way is to prospect in areas that are further away from towns. Remote places will have less mining pressure simply because there are less people there. Lots of places like Northern Nevada or remote goldfields in Idaho and Montana still have some very good potential because they haven’t been hit very hard compared to more populated states such as Arizona and California. The second way to get away from the crowds is to put on your hiking boots! Even in areas that get prospected very hard, you can still find good areas if you are willing to put in the work that others don’t. I know some guys who metal detect for gold in the Sierra Nevada Mountains of California who routinely find good gold. The general area they are hunting is certainly no secret. This is where to California Gold Rush happened. Everybody knows there is gold in the Sierras, but these guys work harder than most. Rather than hitting the spots that are easy to get to, they go on long hikes, dropping down into deep roadless canyons and nasty steep spots that the faint of heart have no interest in. Remember those 3 tips that I gave at the beginning of this article? Those still apply! I’m not telling you to venture into some random roadless canyon with no purpose and assume there is going to be gold there. You still want to do your research and believe that there might be some gold there. Gold isn’t that hard to find. You can likely find a few specks of gold just about anywhere if you are in rich gold country. But finding truly rich gold deposits is harder than ever. If you want to find those really productive areas, consider strapping on a pair of boots and putting in work. There is still good gold out there to find.